Where was Glasgow's first indoor ice rink? Where is there a 110 year old outdoor curling rink in Glasgow? I had been reading about both of these things recently when I saw the answer to one of these questions come up in a news article in the Daily Record today. I was pleased to see a story on the Daily Record website that the O2 ABC concert venue is temporarily to revert back to its former guise as a cinema, for one night only. 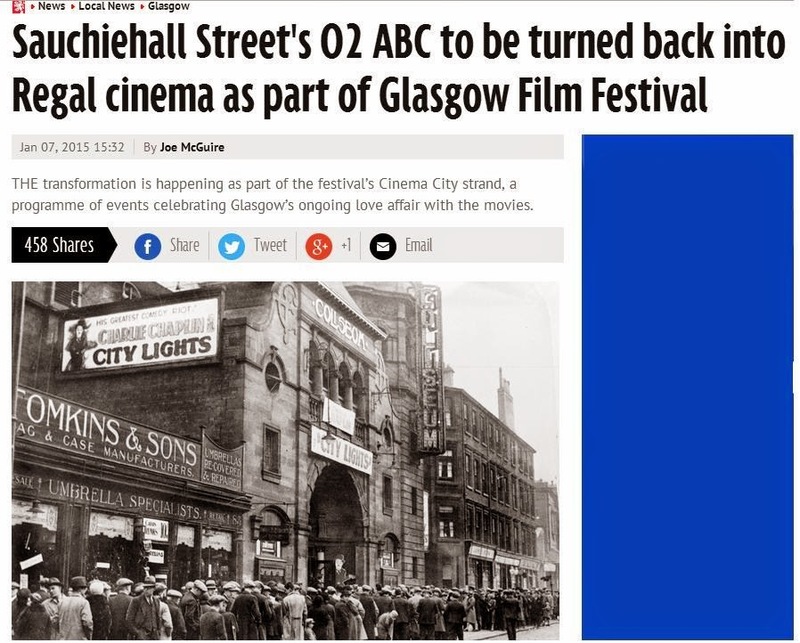 This is for a night commemorating the O2 ABC on Sauchiehall Street's former life as the ABC Regal cinema, as part of the Glasgow Film Festival in February 2015. However the news article was illustrated by a picture of a different building altogether, which is nearer the O2 Academy venue on the south-side. The photo they used from the 1930s was the Coliseum cinema, now sadly demolished after a fire, where the first "talkie" movie was shown in Glasgow. I've been to many concerts in the Sauchiehall Street O2 ABC and quite like it as a venue. They did a decent job refurbishing it and keeping it as an entertainment space after the cinema finally closed in October 1999. 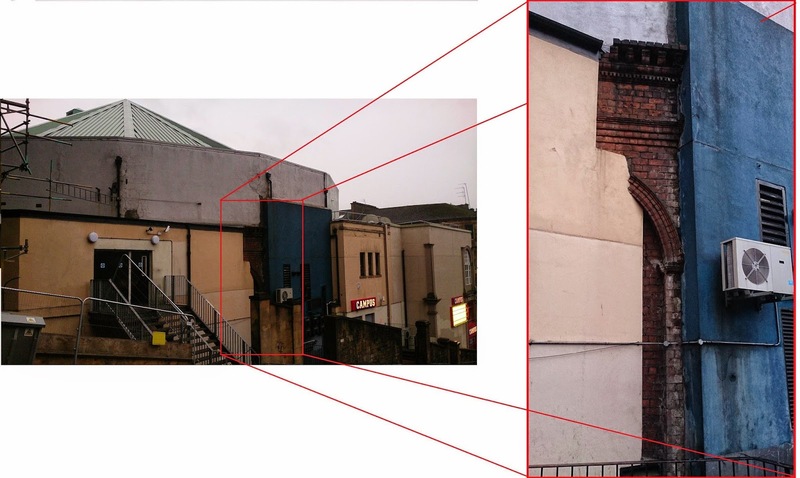 By then the cinema had been running at this site for 70 years. The picture below shows it in its glory days as a cinema, when it had one screen, a 2300 seater auditorium and an RS McColl's by the door to get your sweeties. In this picture you can see the empty space to the right where the 1960s extension was added to provide an extra screen. In 1979 the main screen was divided to make four more smaller halls, so that when I was going to it as a child it always had rather labyrinthine corridors taking you to one of the five screens. I can remember which films I saw at which cinema when I was younger. Nowadays all the cinemas are so uniform that they merge into one. I remember seeing Highlander here at the ABC with some friends from school in 1986. I remember that I saw Gremlins and Dumbo at The Grosvenor Cinema off Byres Road, Watership Down and Rocky 3 at La Scala on Sauchiehall Street, Ghostbusters and Star Wars at the Odeon on Renfield Street and Grease at the Salon off Byres Road. The grim live action/ animated version of Lord of the Rings from 1978 I think I endured as a very wee boy in the GFT (only at the end of the film did you find out that this was only half the story, no sequel was ever made). I was intrigued to discover that the ABC cinema when it opened in 1929 was in a building already 55 years old, that had gone through several uses. Built in 1875 it started out as a circular building, a domed "Diorama" - where paintings of famous battles would cover the walls. By the time of the 1888 "International Exhibition of Science, Art and Industry" at Kelvingrove it was called the Panorama, with an illustrated re-telling of the Battle of Bannockburn adorning the walls for people to enjoy. If you look at the etching below you can recognise the shape of the arched windows still seen at the Sauchiehall Street face of this building. 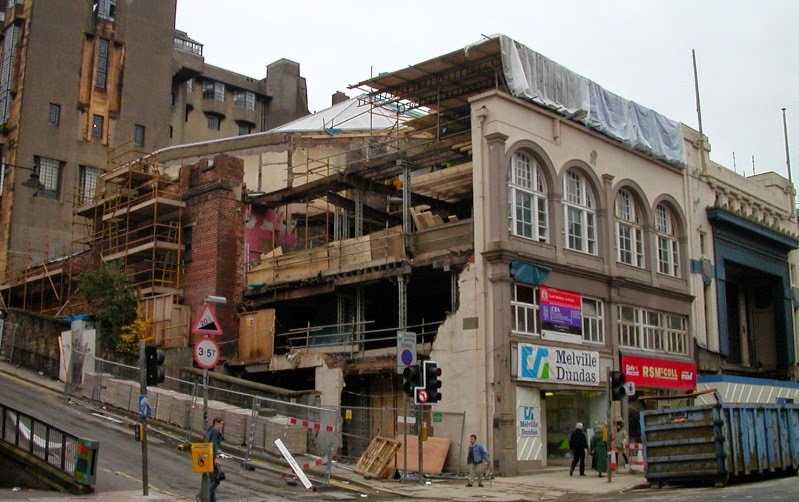 What is harder to picture is a circular building filling this space, unless you look at this picture below taken during the extensive refurbishment work in 2002. From the Scott Street side which leads up to Mackintosh's Art School building behind, you can see the circular shape of the original auditorium space. 2002 refurbishment work at the ABC building. The hall was owned by South African impresario Arthur Hubner, who later owned the Brittania Panopticon. When he decided there was no future in dioramas he converted the building into Scotland's first indoor ice rink in 1895, the Glasgow Ice Skating Palace. The circular rink 95 feet across had an orchestra performing on the platform seen in the architect's drawings above which were done for the conversion. It was apparently home to Europe's first international ice hockey match when crowds of 1000 people watched exhibition matches against an English team. As an ice rink it wasn't a great success and lasted only two or three years. During that time Hubner showed Glasgow's first ever film screenings here with the newly invented "cinematograph" in 1896. These included short films of local interest, eg a paddle steamer heading off from Rothesay pier or the Gordon Highlanders leaving Maryhill barracks. The building was then converted into The Hippodrome, complete with a circus ring and water tank underneath. From 1904 to 1924 it was home to Hengler's Circus, showing films in the hall when the circus was not performing (the name lives on as a JD Wetherspoons pub across Sauchiehall Street opposite the dental hospital). In 1927 it re-opened as the Waldorf Palais dance hall and in 1929 finally was re-invented as "The Regal", the ABC's grandest Glasgow cinema. The thread in the Glasgow film festival this year marks Glasgow's place as a "cinema city" in the 1930s, with more cinema screens per head of population than anywhere else in the world. Before anyone came up with the idea of indoor ice rinks people were skating and curling on Glasgow's ponds and rivers, particularly during the colder winters 150-200 years ago. A "Glasgow Skating Club" was formed in 1830 and a Glasgow map of 1894 of Bingham's pond calls it a "Boating and Skating Pond" with a rectangular "Curling Pond" laid out alongside. 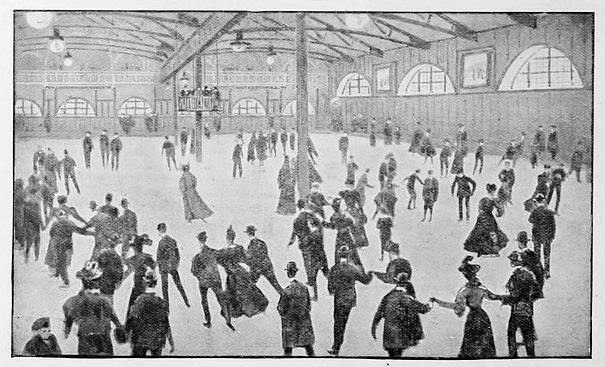 After Glasgow's first indoor ice rink closed in the late 1890's it was a few years before Glasgow's skaters had a new indoor venue. Crossmyloof ice rink opened in 1907 and this was where I first went ice skating aged about 12, a few years before it finally closed in 1986. When I was there I think it was on its last legs and we had the ice to ourselves. I could hardly stand up as the leather in the scabby old ice skates that they handed out was so knackered that they gave absolutely no support. The boots didn't seem to hold my dad back though, who had skated there as a youth. However from the picture below you can see that it did have grander days in the past and was home to ice skating, curling and ice hockey for almost 80 years. It is now demolished and the Morrisons supermarket at Crossmyloof stands where it once was. In 1918 with falling attendances during the war, the building was sold to Beardmore's who used it for manufacturing airplane engines, but in 1928 it was redeveloped as an ice rink again. There was a flurry of ice rink building at that time of which only the Kirkcaldy rink (built in 1937) and the Murrayfield rink (built in 1939) are still up and running in Scotland. In Glasgow the Kelvin Hall briefly had an ice rink, but it was 1986 before Glasgow had another rink, the Summit Centre in Finnieston. I had many a portion of chips in the cafe when hanging about down there, resting my aching calves after skating with their big solid plastic boots. This lasted from 1986 to 1998 when it had to close due to subsidence blamed on the River Kelvin flooding. Since then Glasgow has had no indoor rink. Skating, curling and ice hockey has migrated to the rink at Braehead, which opened in 1999. When I've looked at old maps of Glasgow in the Mitchell Library my eye is often caught by the now long gone "curling ponds" marked in them. The Drovers Inn on Byres Road changed its name to Curlers in 1849 as the Partick Curling Society (which exists to this day) used to meet here and a curling pond was laid out in the land behind it. Another curling pond could be found up in the Botanic Gardens. The map on the website "Historical Curling Places" shows some of the sites of the 80 curling ponds that have been identified around the Glasgow area including at Church Street, St Vincent Crescent and several at Anniesland and in the grounds at Gartnavel Royal Hospital. One of the most interesting though can still be found in Victoria Park. As warmer winters meant less chance to curl on natural ponds John Cairnie, a former surgeon with the East India Company, devised a way to make artificial curling ponds. The idea was to have a shallow bed with a raised edge that could be artificially filled gradually with water which would freeze in layers. Once John MacAdam invented macadamisation, the perfect lining for these ponds was available. Partick Curling Club now practice at Braehead rink, but their clubhouse in Victoria Park still stands beside their Cairnie rink, which was built in 1902. Their clubhouse still contains a lot of the club's old curling equipment apparently and is now a Grade A listed building, but unfortunately is hidden inside a Glasgow City Council parks department depot. However from Balshagray Avenue you can see the curling pond and the markings on the floor of it. So Glasgow has no indoor ice rink, and when we go to visit relatives in Fife this weekend I'm planning to drag my children along to the Fife Ice Arena in Kirkcaldy, where the Fife Flyers ice hockey team play, for a wee bit of skating. 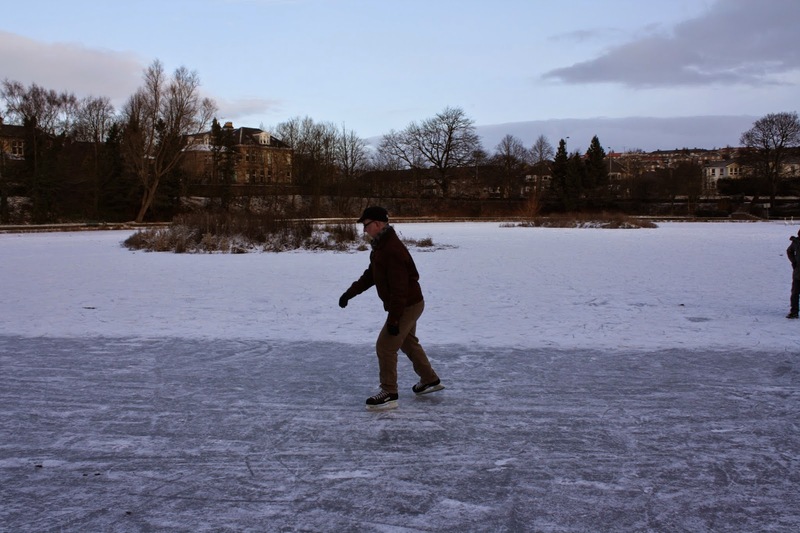 Where was Glasgow's first indoor ice rink? - At the ABC on Sauchiehall Street. Where is there a 110 year old outdoor curling rink in Glasgow? - In Victoria Park in the west end. I can't finish this without mentioning the dark cloud that now hangs over the annual Glasgow On Ice festival, which has featured an open air ice rink in George Square every winter over recent years. I've taken my children there or to see the lights, I've gone along as a helper with their primary school classes, everyone in the city knows it inside out. This year Christmas shoppers and people heading to enjoy the activities in George Square were caught up in a tragic accident, when a bin lorry crashed into the crowd here. Several people died and many are still recovering from their injuries. Details of how to donate to the fund set up to help those affected by the incident can be found here. May I ask what your source information was for your information about Arthur Hubner ? I trying to write short biographies on some early Cinematograph entrepreneurs for a project connected with the refurbishment of the Picture House in Campbeltown. Sorry written a while ago - various online sources, including "Scottish Cinemas and Theatres Project" at http://www.scottishcinemas.org.uk/glasgow/ . Also a book "Played In Glasgow", about old sports venues, which had a page on the ABC venue as an ice rink.